When I think of Stabilo I don’t think of great pens, I think of highlighters, as that is what they are most famous for. I have never been a fan of their pens but the Bionic Worker is the first that I would actually buy again. 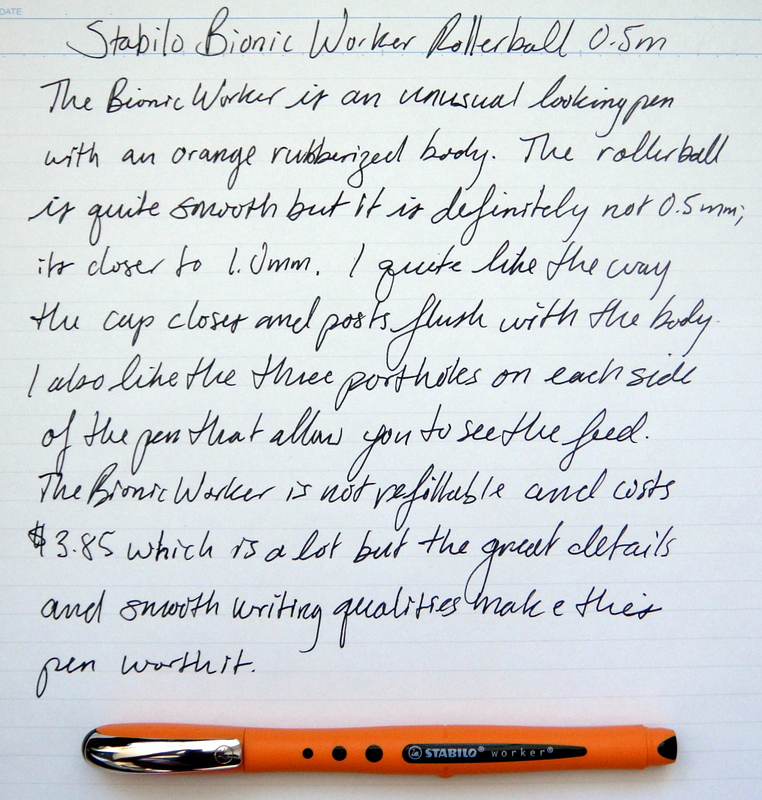 The Bionic Worker is an unusual rollerball pen with a rubberized orange body. Stabilo labels this pen a 0.5mm but it’s definitely much wider than that; it seems like a 1.0mm to me. The rollerball is ultra smooth (as you would expect a 1.0mm tip to be) and the ink is nice and dark. Stabilo calls the nickle silver tip indestructible. I really like the details on this pen. There is a little knob on the side of the body that keeps the pen from rolling off the desk. The cap closes and posts flush with the body and there are three little portholes on each side of the pen that allow you to view the feed and ink level. The metal clip features the Stabilo swan and feels sturdy. The Bionic Worker comes in black, blue, red and green ink with “0.5mm” and “0.3mm” tip sizes. This pen is not refillable which is too bad because it is expensive at $3.85. Next time I am going to buy the 0.3mm tip as I suspect that will be a bit closer to a true medium. Next Post Uni Woodnote 0.38mm Gel Pen Review ….OUCH!